Radars are critical for understanding the weather; they allow us to “see” inside clouds and help us to observe what is really happening. Working together, engineers, technicians, and scientists collectively design, develop and operate the advanced technology of radars that are used to study the atmosphere. Doppler weather radars are remote sensing instruments and are capable of detecting particle type (rain, snow, hail, insects, etc), intensity, and motion. Radar data can be used to determine the structure of storms and to help with predicting severity of storms. Energy is emitted in various frequencies and wavelengths from large wavelength radio waves to shorter wavelength gamma rays. Radars emit microwave energy, a longer wavelength, highlighted in yellow. The radar transmits a focused pulse of microwave energy (yup, just like a microwave oven or a cell phone, but stronger) at an object, most likely a cloud. Part of this beam of energy bounces back and is measured by the radar, providing information about the object. Radar can measure precipitation size, quantity, speed and direction of movement, within about 100 mile radius of its location. How Does Doppler Radar Work? Doppler radar is a specific type of radar that uses the Doppler effect to gather velocity data from the particles that are being measured. For example, a Doppler radar transmits a signal that gets reflected off raindrops within a storm. The reflected radar signal is measured by the radar's receiver with a change in frequency. That frequency shift is directly related to the motion of the raindrops. When a storm is stationary, the transmitted energy and the reflected energy or “echo” will not change, as shown below. When a storm is moving towards the radar, the transmitted wavelength's frequency will be lower than the reflected wavelength frequency. 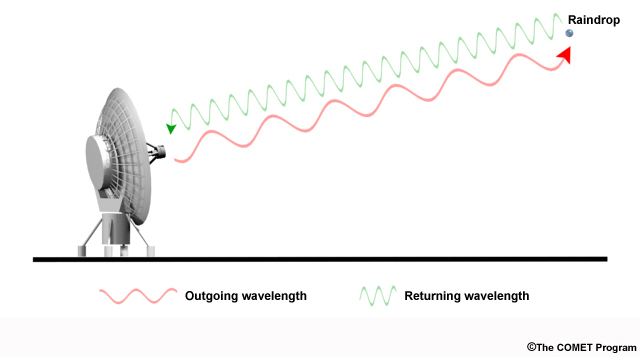 When a storm is moving away from the radar, the transmitted wavelength’s frequency will be higher than the reflected wavelength’s frequency. Why does NCAR use radars for research? Atmospheric scientists use different types of ground-based and aircraft-mounted radar to study weather and climate. Radar can be used to help study severe weather events such tornadoes and hurricanes, or long-term climate processes in the atmosphere. The NCAR S-Band Dual-Polarization Doppler Radar (S-PolKa) is a 10-cm wavelength weather radar initially designed and fielded by NCAR in the 1990s. Continuously modified and improved, this state-of-the-art radar system now includes dual-wavelength capability. When the Ka-band is added, a 0.8-cm wavelength radar, it is known as S-PolKa. S-PolKa’s mission is to promote a better understanding of weather and its causes and thereby ultimately provide improved forecasting of severe storms, tornadoes, floods, hail, damaging winds, aircraft icing conditions, and heavy snow. In the air, research aircraft can be outfitted with an array of radars. The NCAR HIAPER Cloud Radar (HCR) can be mounted to the underside of the wing of the NSF/NCAR HIAPER research aircraft (a modified Gulfstream V jet) and delivers high quality observations of winds, precipitation and other particles. It was designed and manufactured by a collaborative team of mechanical, electrical, aerospace, and software engineers; research scientists; and instrument makers from EOL.